After the near disaster in August during the burning of two brush piles (see Fire! ), we still had four piles left to burn. Our August experience suggested that we wait to burn the remaining ones until the arrival of cooler, wetter weather and until our own water system was working. 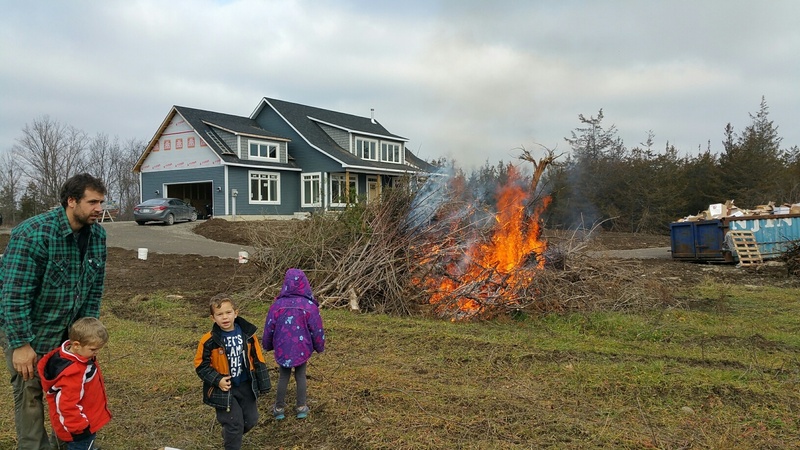 This past Saturday seemed to be a good time to try burning; all conditions had been met and both Jonathan and Andrew and their families were with us and wanted to see the action and help out as needed. This time there was little drama and the neighbour across the road seemed fairly unconcerned when I called out that all was under control. The fire burnt well for the most part and everyone and everything was safe. The grass is short and green in the foreground because the long grass was burnt in August when the brush pile got out of control. Note that the house siding is almost completed. The amount of siding shipped was not quite enough so we may need to wait for completion until more arrives.